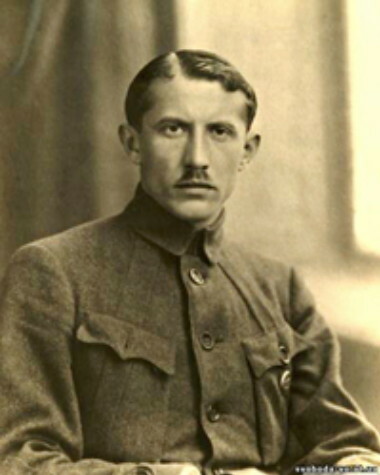 Konovalets, Yevhen [Konovalec’, Jevhen], b 14 June 1891 in Zashkiv, Lviv county, Galicia, d 23 May 1938 in Rotterdam, Netherlands. Military commander with the rank of colonel in the Army of the Ukrainian National Republic, and political leader of the nationalist movement. Studying law at Lviv University, he was active in the Prosvita society and in the campaign for a Ukrainian university. He became active in politics as a student representative on the executive committee of the National Democratic party. Serving as a second lieutenant in the Austrian army during the First World War, he was captured in 1915 by the Russians and interned in a prisoner of war camp near Tsaritsyn. 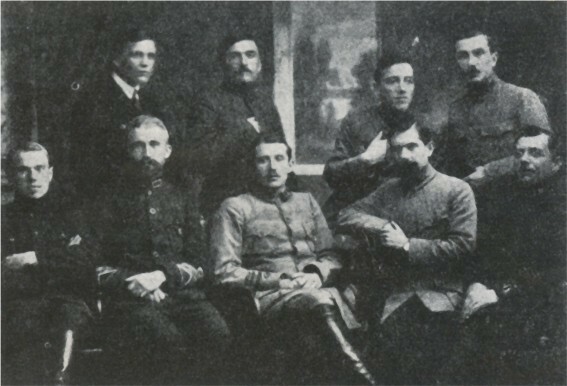 There he joined a group of Galician officers (Andrii Melnyk, Roman Sushko, Vasyl Kuchabsky, Ivan Chmola, and F. Chernyk), escaped with them to Kyiv, and organized the Galician-Bukovynian Battalion of the Sich Riflemen in November 1917. Two months later Konovalets assumed command of the battalion, which was reorganized and renamed the First Battalion of Sich Riflemen. Committed to the idea of an independent and unified Ukraine, this force distinguished itself in suppressing the Bolshevik uprising in Kyiv, in resisting Mikhail Muravev's offensive, and in liberating Kyiv by March 1918. Because they refused to recognize the new Hetman government, the Sich Riflemen were disarmed and disbanded by the hetman's German allies. 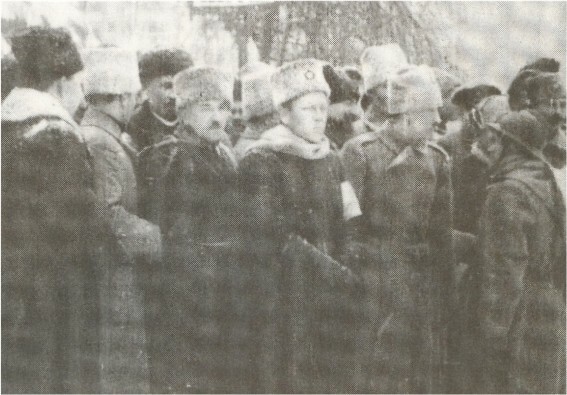 Prompted by the Ukrainian National Union, Konovalets obtained the hetman's permission to re-establish his unit and formed the Separate Detachment of Sich Riflemen in Bila Tserkva. In November 1918 this force played a key role in overthrowing Pavlo Skoropadsky and restoring the Ukrainian National Republic. Later Konovalets expanded the detachment into a division, corps, and finally, a group. In December 1919 the force was demobilized, and its commander was interned in a Polish prisoner of war camp in Lutsk. With Symon Petliura's blessing he went to Prague in spring 1920 to win Galician support for a brigade formed of Ukrainian soldiers held in Czechoslovak internment camps and Italian prisoner of war camps. Yevhen Petrushevych's strong opposition put an end to this plan. With the cessation of war, Konovalets decided to continue the struggle for independence by underground means. In summer 1921 he returned to Lviv to take charge of the Ukrainian Military Organization (UVO) and to build up its organizational network. Emigrating in December 1922, he lived with his family (wife Olha and son Yurii) in Berlin (1922–9), Geneva (1929–36), and Rome. He maintained control of the UVO and established contacts with foreign, particularly German and Lithuanian, intelligence and military circles. To win political support from Western governments and public sympathy for the cause of Ukrainian independence, he promoted the setting up of foreign-language press bureaus (see Press and information bureaus abroad) and publishing houses abroad. Recognizing the various groups of young nationalists at home as his natural allies in the struggle for independence, he unified them into one organization, the Organization of Ukrainian Nationalists (OUN est 1929), and as the head of the Leadership of Ukrainian Nationalists (PUN), channeled their activities to politically motivated goals. During a visit to the United States of America and Canada, Konovalets encouraged his followers to establish Ukrainian veterans' associations, which became the nuclei of nationalist community organizations: the Organization for the Rebirth of Ukraine in the United States and the Ukrainian National Federation in Canada. In the 10 years in which he led the OUN, Konovalets consolidated its position in Ukraine and abroad, promoted the development of all-Ukrainian community organizations in France, Germany, and Austria, and tried to bring the Ukrainian national question to the attention of the League of Nations. His persistent efforts to revive the nationalist underground in Soviet Ukraine led to his assassination by a Bolshevik agent. Konovalets was one of the most prominent figures in 20th-century Ukrainian history. 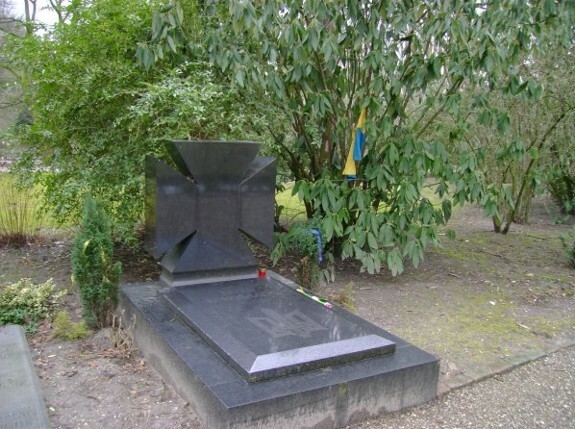 As a military officer he was noted for his organizational abilities and loyalty to the Ukrainian National Republic. As a political leader he was able to unite high principles with operational flexibility and to combine creative thinking with intricate organization and effective action. He enjoyed enormous personal authority among OUN cadres, and the respect of even his political adversaries. Konovalets set down his recollections about the war period in Prychynky do istoriï ukraïns’koï revoliutsiï (Materials for the History of the Ukrainian Revolution, 1928; 2nd edn, 1948). A special foundation, set up on the 20th anniversary of his death, published a collection of materials on his life and work, Yevhen Konovalets’ ta ioho doba (Yevhen Konovalets and His Era, 1974), edited by Yurii Boiko and M. Borys.